Yummmm yum yum yum! I love these things dipped in chocolate glaze and sprinkled with coconut. I also love them with a little bit of huckleberry puree in the dough. Oh heck I just love these things! For the huckleberry doughnuts I took the dough and divided it in half. With half the dough, I added ¼ cup of huckleberries I’d ground in the food processor and then kneaded in enough flour to make it the consistency of the plain dough. 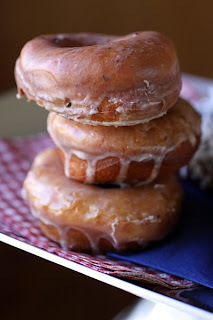 After frying the huckleberry doughnuts I dipped them in vanilla glaze. I think I might use a little less vanilla extract next time. It overpowered the flavor of the delicate huckleberries a bit. 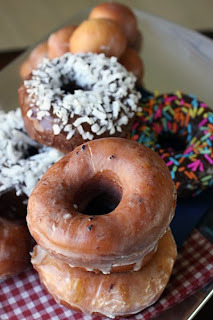 With the plain dough I made chocolate glazed doughnuts and top them with sprinkles and coconut. My daughter claimed the sprinkled ones and my husband the coconut. I think the two of them ate most of their calories in doughnuts this past weekend. I'm feeling a tad guilty about this. 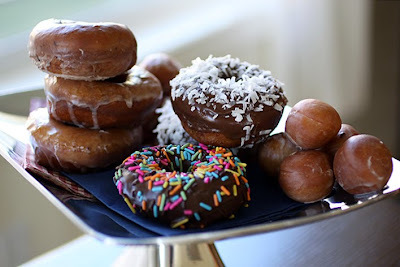 You might find it easier to just run to your local donut shop, but there is a benefit to making your own. Because they get fried so quickly and drained well on paper towels they are not greasy. Granted I didn’t say healthy! Just not greasy. Oh, and my friend Krista says doughnut holes have no calories. I think her logic makes perfect sense. So don't forget to fry those up too. Top with your choice of sprinkles, coconut, nuts, bacon, Fruit Loops cereal, or anything you think should be on top of a doughnut. 24. Stir in water 1 tablespoon at a time, until desired consistency. Recipe from Roosie on RecipeZaar. Pictures by Laura Flowers. I've made these before, they are to die for good!! I'll have to try the added fruit variation, sounds yummy. They are gorgeous Laura!! Each and every one..Just perfect! 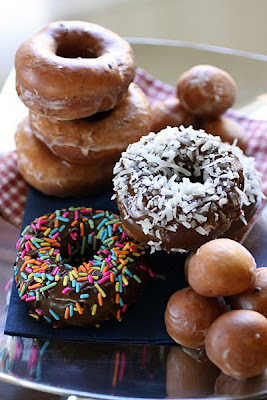 ~The fruit are quite good Coleen, but its pretty difficult to beat a chocolate covered doughnut with coconut on top! I didn't even need to know about this. Now that I can make them myself, I'll never lose this extra weight! Wow!! I think my husband would LOVE these!! O-M-G!!! I want these doughnuts so badly! YUMMMMMMMY!!! THAT IS IT!!! I can't believe you made those. WELL I believe it, I just can't believe it!! They look beyond AWESOME!! You have pretty much out done yourself and I am not sure what you follow these up with. I can't wait!! Have a great week. . . .
You actually made these? I don't know anyone who makes doughnuts. They look like the freshly made ones at Dean & DeLuca that sell out by midday. Would love to try one of those. Linda they aren't too difficult. Really. Much like making cinnamon rolls but different at the end of course. Wow, you did a fantastic job on these! I just made donuts for the first time myself last week, it was a lot of fun. Next time I'll have to try this recipe - and invite a few friends over to take them off our hands! Wait, I was supposed to have help from friends? wow complimenti!! meravigliosi e buonissimi! These look good enough to make me want to join the police force :-). Donuts must be the most enticing food, ever. These look incredible, incredible! Um yeah, Hi. I'll take a dozen chocolate glazed with sprinkles please - to go. I love what Kathia said on her blog... your photos make us fat! I have never made doughnuts...I have been afraid too, I guess. These look wonderful! The photography...awesome! I am guessing this is one of your most popular posts ever!!! I am not a huge doughnut person, but I will do a lot for a warm krispy kreme. Glad to know I can easily make them at home! Okay, Laura, that does it, I'm coming to visit! And I want donuts everyday. I will help if you ask me to. These look fabulous! Fabulous! And son has been begging for me to make donuts (see, you are a nicer mom than I am) and I have just found my recipe! And you made my day today: I woke up to your slew of comments left on everyone of my latest blog posts! LOL You are the best! We will meet, I promise! Of course you can! I hope you had a great Birthday!